I have a small notebook that I use to record the funny things that happen in our lives. So far most of it is all about Bekah. Soon Hannah will be joining the ranks as well. Here are some things that I never thought I would ever have to say. "Smell the candle with your nose, not with your fingers." "Milk doesn't go in daddy's nose." Bekah was helping put away grocery's when she found Bacon Bits. She held them up and confidently said, "Kitty Food." Bekah loves to call her sister, "Hannah Peanut!" and she says, "Hang on Peanut." We have a snowman that has magnetic arms. One day Bekah took one of the arms off the snowman to play with it. Emma, our kitty, was standing on the arm of the couch. She was up to the kitty and tried sticking the snowman's arm in Emma's rear. Daddy asked her what she was doing. She said that she was trying to push the kitty's "button". Bekah loves our Advent Christmas tree. 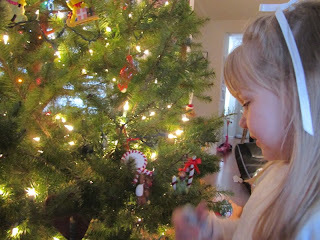 AFter she figured out what it was all about she got so excited when we would put a new ornament up.She loved looking at each one a dozen times. Once she started smelling them all and saying that they tasted good too. Each day we have to count all the ornaments hanging on it or she melts down. She calls the Christmas tree a friss friss tree. I got Bekah up from her nap the other day. She was singing, "Ho ho ho, Ha ha ha." She was trying to sing the Hosanna song. Bekah was looking at the nativity snow globe. She thought all the wise men were Jesus. Then she pointed to a gift one of teh wise men had for Jesus and said, "Toast." After Chris had the flu he said that he was wiped. Bekah piped up with, "I need a wipe too." So there you have last Decembers funniest moments. More to come shortly!